The Board of Deputies and a Jewish MP have condemned a Brexit campaign group for saying Labour’s anti-Semitism problem is due to the party’s reliance Muslim voters. 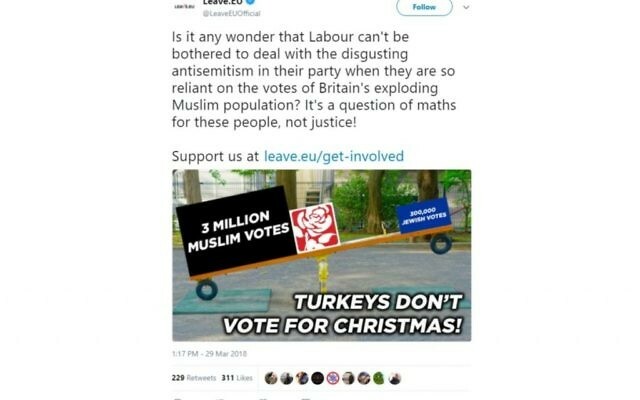 The tweet by pro-Brexit organisation Leave.EU has been branded “offensive” by a cross-party group of MPs. The All Party Parliamentary Group for British Muslims has called on Leave.EU to withdraw the “inflammatory” post and apologise, as did the Board of Deputies of British Jews. Recently elected Leeds MP Alex Sobel, who is Jewish, tweeted: “As a Jewish Parliamentarian I ask you to apologise for this horrendous Islamophobic comment”, while other MPs such as David Lammy, said he wanted to report it to the police. 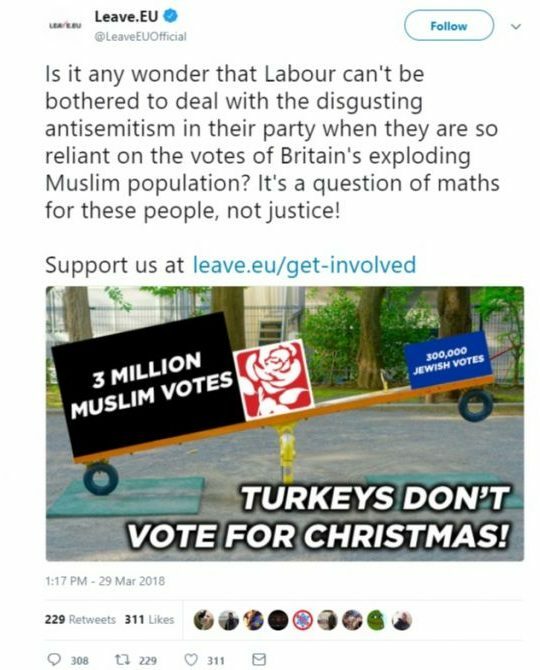 Tory MP and co-chairman of the APPG for British Muslims, Anna Soubry, said: “This tweet is thoroughly distasteful and offensive. It is also nothing to do with leaving the EU. Labour MP Wes Streeting, who is co-chairman of the All Party Parliamentary Group for British Jews, said: “Muslim and Jewish communities will be disgusted by this cynical and nasty attempt to stir up hatred and division. “Muslims and Jews know what it is to experience prejudice based on their race and religion and will stand together against this type of ugly rhetoric. This comes after Jeremy Corbyn pledged to deal with 70 outstanding cases involving claims of anti-Semitism within Labour ranks as soon as possible.